Donald Trump on Tuesday outlined three child care proposals to alleviate the financial burden on parents. His campaign offered more details on a child care tax deduction he'd proposed in August, and introduced two new ideas that he now backs: partially paid maternity leave and the creation of a tax-advantaged, dependent care savings account. Advocates for paid family leave have welcomed all discussion of the issue by candidates. But they're not wowed by Trump's ideas. Tax and budget experts, meanwhile, have their share of concerns about how the proposals would work, how much the plans would really cost and who'd benefit most. New mothers would be guaranteed six weeks of partially paid leave. Women whose employers don't offer paid maternity leave could collect six weeks of unemployment benefits when they have a child. "It's great to see candidates addressing the need for paid leave," said Ellen Bravo, executive director of FamilyValues@Work. But, she noted, it's not just women who are parents of new children. Fathers need time as well. The campaign estimates the program would cost about $2.5 billion a year, but said it would pay for that by ridding the unemployment insurance system of fraud, which it valued at $3.4 billion. Economist Douglas Holtz-Eakin, who runs the right-leaning think tank American Action Forum, worries that this kind of proposal invites employers to drop their paid maternity leave policies and "stick it to the taxpayer." If he's right, that would drive up the cost of the proposal. Also, stamping out fraud and abuse can be a difficult, even costly process that doesn't always yield as much as hoped. The campaign characterized its proposal as only a safety net for women to recover. Companies that want to compete should not "take advantage of the UI system. ... We believe that a full family leave program should come from employers in their benefits package as they compete for workers," a Trump aide said. Holtz-Eakin, who has advocated for unemployment insurance reform, also said the maternity leave benefit would change the program's mission but do nothing to improve its performance. Trump's aide noted "we'd look for new ways to run the program more efficiently." Parents could deduct the average cost of child care. Parents could deduct the average cost of child care in their state, based on their child's age. The deduction would be available for up to four children or elderly dependents. Anyone making less than $250,000 ($500,000 if married) would be eligible to take the tax break. It would also be available to stay-at-home parents who have a working spouse. Lower-income working parents who don't end up owing federal income tax could still receive the tax break through their Earned Income Tax Credit by an amount worth up to $1,200 a year. Low-income families must stretch to pay for child care and need assistance as payments come due, said Elaine Maag, a senior research associate at the Tax Policy Center. But under this proposal they will have to wait until tax time to get any relief. The plan would create a dependent care savings account. Trump would give a tax break to anyone who sets aside up to $2,000 a year to cover costs associated with child care and elder care. The money could be used for child care, after-school enrichment programs and private school tuition. It could also cover in-home nursing and long-term care. Low-income families who manage to set aside up to $1,000 in a year would get a match up to $500 from the federal government. While the match would provide welcome funds for struggling families, very few low-income families are able to save $1,000 a year, Maag noted. And those who do would not get tax benefits from the savings because chances are they don't owe income tax anyway. By contrast, the accounts would be "an excellent way for high-earners to shelter income" and use it tax free to pay for something they would have paid for anyway, such as private school, Maag said. Vivien Labaton, co-director of Make It Work Action, was more pointed, criticizing Trump's proposals broadly as "designed for the Ivanka Trumps of the world, not the majority of working Americans." Trump's opponent, Hillary Clinton, offered a multi-pronged plan several months ago. 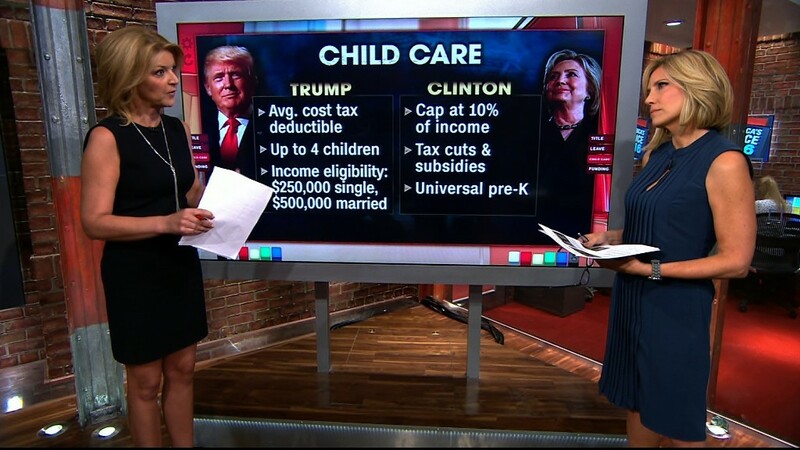 She would cap the cost of child care at no more than 10% of a family's income, guarantee 12 weeks of paid family leave, and provide universal pre-K for 4-year olds.